Print the Whole 30 marinade recipe here! Hey hey hey! How is everyone doing? I am slowly catching some time here and there to work on my to do lists and occasionally share something on the blog, but this summer schedule has officially thrown me for a loop! Not to mention, the sweltering Houston heat and humidity has settled in for the long haul and we're miserable. Lorenzo refuses to walk in the mornings unless it's to sprint back towards the house so we've resorted to bike rides and walks with him riding in the stroller. While it's not exercise he is at least with me and getting stimulated from the sites and sounds. He runs rampant in the yard before and afterwards though. Little bunny. With our crazy schedules and travel plans I am keeping the Whole 30/Paleo cooking to as easy as possible right now so I won't be dabbling with too many intricate recipes until later in the summer. That is why I was thrilled to have the opportunity to try Mikey's tortillas! In fact, I'm stocked with a bunch of Mikey's products right now and am itching to give them a try. They're certified Paleo containing no gluten, grain, soy or dairy, and non-GMO project certified. YUP. Bring on the deliciousness that is also healthy. We first tried them for breakfast with eggs and seasoned ground turkey. We followed the instructions on heating them in a pan stove top, but they hardened up a little too much. Possibly chef's error! 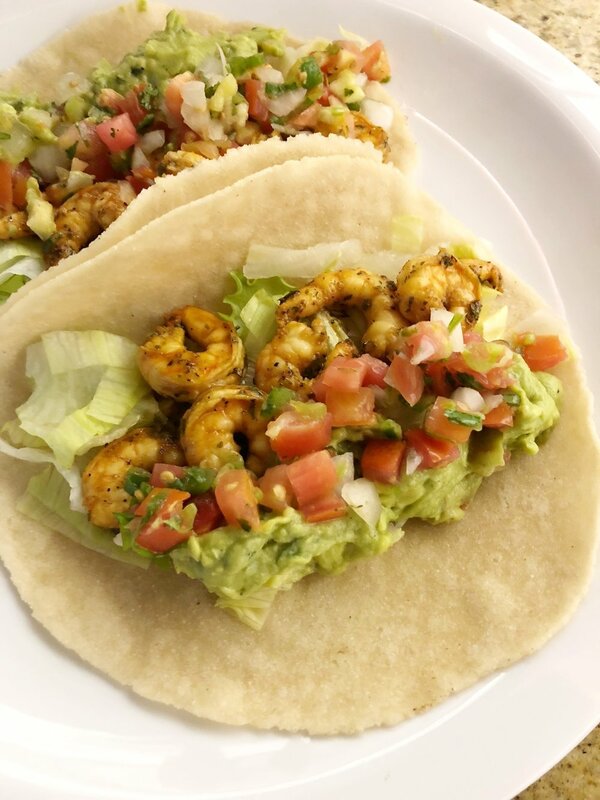 When we used Mikey's tortillas this night for dinner with the shrimp, I placed a wet paper towel over them for about 10 minutes before I nuked them for 30 seconds in the microwave still wrapped in the wet paper towel. They were perfect! Strong and sturdy to hold the tacos and not fall apart from the marinade, yet soft like a soft taco. I'm impressed! Mix all of the marinade ingredients together. Pour over thawed shrimp in a shallow bowl and cover, or into a gallon sized Zip-lock bag. Allow to marinate in the refrigerator for 30 minutes. Pour the shrimp and as much of the marinade as you'd like into a saute pan over medium heat. Cook until the shrimp are pink and opaque. Serve immediately! We assembled the shrimp tacos using: Mikey's tortillas (Paleo), shredded lettuce, HEB guacamole and pico de gallo. Have you tried any new recipes recently? I'd love to hear! I'm always looking for new ideas to try. Remember to check the ingredients of any store bought items to make sure they're compliant for Whole 30 or Paleo (or whatever nutrition lifestyle you're following). Coconut aminos can be non-compliant if there's any soy and I read the Bragg's coconut aminos have soy in them. I haven't looked myself at Bragg's coconut aminos, but The Big Tree Farms organic coconut aminos I found at HEB are soy free and made from: Certified organic fair trade coconut blossom nectar, water & balinese sea salt.